Well I am back on my design work and I would like to introduce the Woodsman Cap. This little cabled delight is a perfect hat for yourself, little ones, or perhaps one for the whole family! 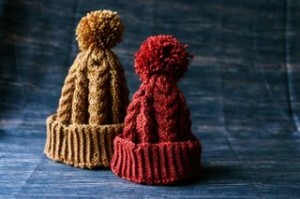 I was really in the mood for some cables this fall and it’s just getting to be cool enough for hats. The flip brim makes the hat extra warm where it counts. 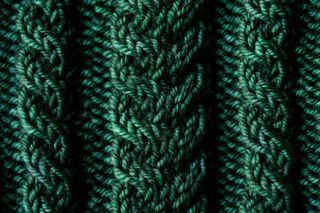 Of course I had to knit a wee one and I liked it so much I made a charming green one just for me! Not only did I feel the need for cables but I’m smitten with pompoms too. While I realize you can use cardboard to create a pompom I find it much MUCH easier with a pompom maker. 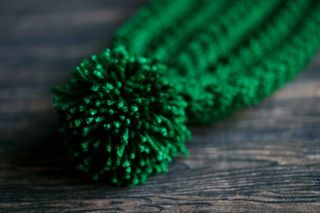 The key to a good full and fluffy pompom is the number of times you wrap the yarn, this is true no matter what method you use. While I realize pompoms tend to be yarn eaters, it’s really worth it. Who wants a limp pompom? The yarn I used was SweetGeorgia superwash worsted and I really love this yarn. 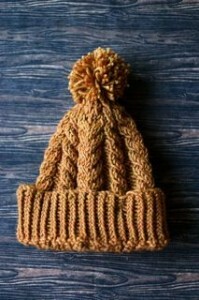 The stitch definition is fantastic for cabling and it’s kind of a stiffer yarn so the hat stands up really well. The pattern should be in shop later today! This entry was posted on Tuesday, October 19th, 2010 at 11:47 am	and is filed under Uncategorized. You can follow any responses to this entry through the RSS 2.0 feed. Both comments and pings are currently closed. Awesome Alexa! Love it. Would love to make some of my own…. That stitch definition is stunning. Can you imagine a whole sweater or afghan? Hint, hint…. Very much agreed on the pom poms, they are definitely worth a few extra wraps to make a firm pom pom.